No Halloween party is complete without the allure of mysterious potions. 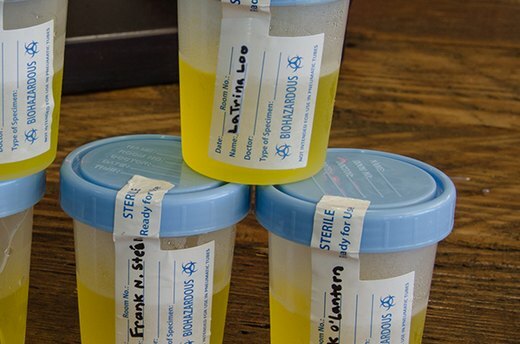 Pick your poison and get ready for some seriously-out-there shots. Note: Alcohol optional, creativity required and squealing inevitable. 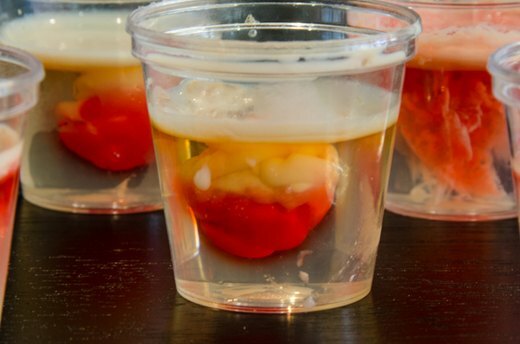 Like the real thing, a brain hemorrhage shot is not to be taken lightly. Sprinkle two packets of unflavored gelatin over one cup of cold water in a pan. Let sit for approximately 5 minutes, and then heat until the gelatin is fully dissolved. Let cool, then add 1 c of peach schnapps. Pour into 1 ounce shot glasses and let sit until the gelatin is about like egg whites. Now for the fun. Fill an eye dropper with Bailey’s Irish Crème and gently poke it into the gelatin; dispense slowly. Repeat with a drop or two of grenadine. Everyone remembers the stink in middle school biology on dissection day. Not to worry, these adorable frogs carry no stench! Per the directions on the previous slide, take the unflavored gelatin and replace the schnapps with vodka (or water if serving to kids). Pour into baby food jars and refrigerate until it partially sets. Insert gummy frogs with a toothpick and serve! If this doesn't get a squeal or two out of your guests, nothing will. This totally gross but completely edible specimen cup is a simple mix of 6 ounces of lemon gelatin and 2 tablespoons of mango gelatin dissolved in 2 cups of boiling water. For an adults only party, add 2 cups vodka (or cold water for kids). You wouldn't want your guests to get dehydrated, now would you? These googly-eyed monsters are the perfect blend of silly and sweet. Dissolve 6 ounces package of orange gelatin in 2 cups of boiling water. For an adults only party, add 2 cups vodka (or cold water for kids). Use clean kitchen shears to cut gum drops in half. 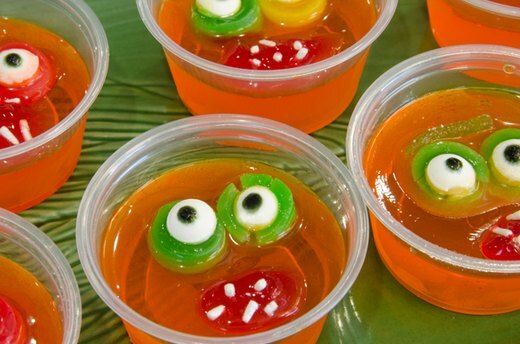 Push a candy eyeball into each half and place them on the gelatin once they’re partially set. Let set fully before adding gel icing mouths and pearlized sprinkle teeth. Here’s a Halloween take on the traditional drunk gummy bears. 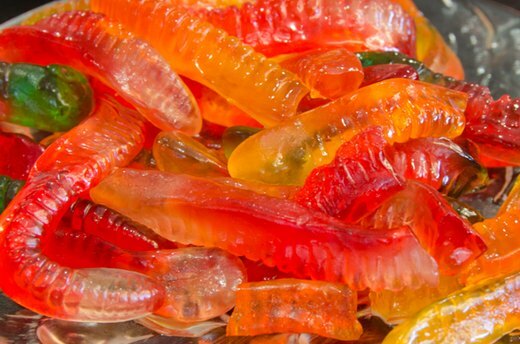 Soak these gummy worms in a mason jar full of vodka and refrigerate them for a few hours. Check periodically for taste and drain when up to your standards; the longer they sit, the more alcohol the worms will absorb and expand! 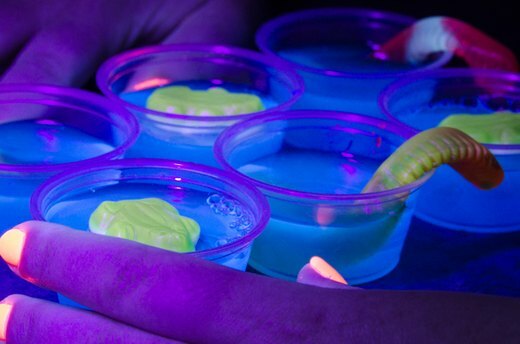 Liven up a party with glow in the dark frog and worm cups. Using tonic water to give them the glowing effect, dissolve 6 ounces of blue gelatin. Add 2 cups of gin. Soak gummy worms and frogs in tonic water for an hour, then drain. Place worms when the gelatin is the consistency of egg whites and set the frogs on top when the gelatin holds its shape. Turn on the black light and watch them glow! If plastic body parts litter your front lawn and house this time of year, you’ll love this simple-to-make body parts buffet. Pour a half-inch layer of gelatin mixed with your favorite clear liquor into a baking dish and let it set about 20 minutes or until fairly firm. 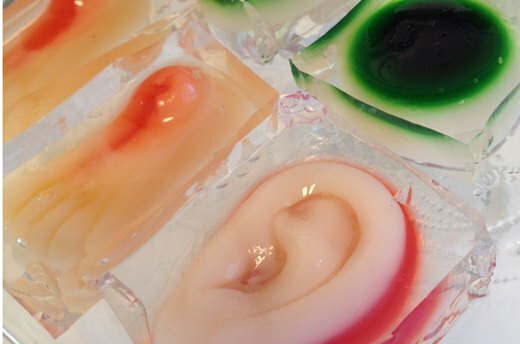 With light force, stick gummy body parts on top. Slightly warm the rest of the gelatin and slowly submerge the candies. Allow to set, then cut into rectangles. Serve, and watch your guests squirm. 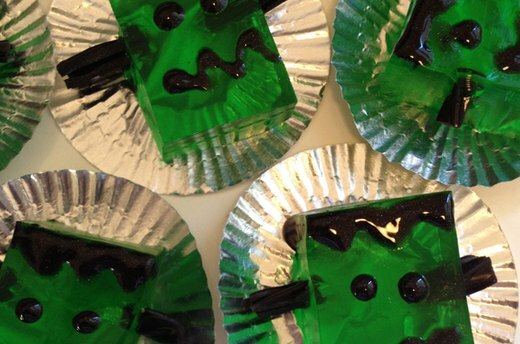 These adorable Frankensteins are perfect bite-size treats for ghouls and ghosts. Pour your lime gelatin mixture into a 9 by 13 baking dish and let it set over night. Right before you’re ready to serve, cut out rectangles and decorate with licorice knobs and black gel icing. The gel icing can get a little runny if it sits on the gelatin too long, so decorate right before serving.